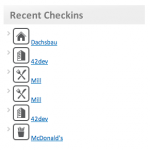 This is a small WordPress plugin, that allows you to show your recent Foursquare checkins and the venue icon as a Widget in your blog’s sidebar. The Plugin is now available through the official 4SQ App Gallery and the official WordPress Plugin repository. Go to “Plugins” in your admin backend. Search for “Foursquare Latest Checkins”. Klick on “Install Now” on the first entry. Download and extract the ZIP file below. 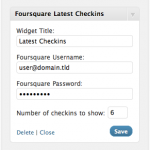 Copy the file “foursquare_latest_checkins.php” to your WordPress installation’s wp-content/plugins Folder. Activate the Plugin in the WordPress Admin backend. 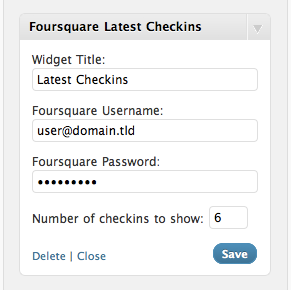 Add the Widget to your desired Sidebar location and fill in the necessary fields. Looks like the plugin gives an error after 4SQ passed to HTTPS. The Plugin is still working fine here and there shouldn’t be any HTTPS related issues, because it uses the Foursquare API, which used HTTPS anyway (at least for non authenticated requests, but that would go too far into oAuth 2 mechanics). The error message means the plugin didn’t get any viable data from Foursquare, so better re-check your username and password in the settings. Could you maybe point me to the URL where you installed the plugin, so I can take a look at it? Could you help me to fix it ? The error means there was no data returned by Foursquare, please re-check your Foursquare login credentials (Email & Password) in the Widget settings. awesome plugin, but it looks like Foursquare has disabled the API you are using. Any plans for an upgrade? Unfortunately I don’t have the time to redo the plugin at this point. I’m very sorry, but as of now I can’t tell you when it’s gonna be available again.